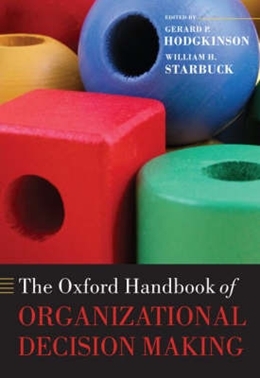 The Oxford Handbook of Organizational Decision-Making comprehensively surveys research on organizational decision-making, broadly conceived. It looks at analysis at the levels of individuals, groups, organization, and inter-organizations, emphasizing psychological perspectives while encompassing insights from economics, political science, and sociology. In-depth case studies illustrate the practical implications of this research. Bringing together established experts to look at individual topics, the Handbook is an authoritative reference work for academics, researchers, and advanced students concerned with decision-making in the areas of Management, Psychology, and HRM. Contributors: Eric Abrahamson, Julia Balogun, Michael Barnett, Philippe Baumard, Teri Jane Bryant, Prithviraj Chattopadhyay, Kevin Daniels, Jerker Dendrell, Giovanni Dosi, Roger Dunbar, Simon French, Mark Fuller, Elizabeth George, Paul Goodwin, Terri Griffith, Peter Grinyer, Gerard P. Hodgkinson, Michael Jacobides, Alfred Kieser, Ann Langley, John Maule, Peter McKiernan, Nigel Nicholson, Greg Northcraft, Annie Pye, Karlene Roberts, Jacques Rojot, Johan Roos, Isabelle Royer, Eugene Sadler-Smith, Zur Shapira, Carolyne Smart, Gerald Smith, Emma Soane, Paul Sparrow, Kathleen Sutcliffe, Michal Tamuz, Ilan Vertinsky, Jane Webster, Karl Weick, George Wright, and David Zweig.